You may be undecided as to which course would suit you best. This page should help you make an informed decision. What skill level is required for our courses? Most of our courses are designed for both the enthusiastic amateur and those with some experience to work together. Whether you have had formal training or not, we believe that a willingness to learn is far more important than having specific skills. Classes are small, usually no more than six. Tuition is individual so you can work at your own pace. I’m a complete beginner. Will I find it difficult working alongside more experienced artists? Far from it. You will learn much by working alongside other artists no matter what standard you are. All our courses (unless otherwise stated) are suitable for all abilities. What type of people come on art courses? Basically, all sorts. A love of art embraces all. What we all have in common is a desire to be creative. Art enables you to discover your hidden talents, whether through drawing, painting, printing or learning to make your own pottery or sculpture. We can help you find out what you do best. I am interested in appying to an art college. Can you help? Yes we can. Specialist help can be given to those wanting to apply to art college, either for foundation courses or specialist degree courses. Organising a portfolio and learning how to produce meaningful and coordinated sketchbooks can be difficult. We can offer support and advice. I’m a practising artist, are the courses suitable for me? Absolutely. All artists work through practice; our tutors are constantly learning new skills and techniques. Discussion forms the basic core of the courses and methods of working are continuously developing. Courses can provide valuable time to explore new approaches and meet like-minded artists. We learn more by working alongside others than we do on our own. Sometimes just experiencing a new environment is enough to stimulate fresh concepts and ideas. How much time is spent working indoors and how much on location? This depends on the length and type of course, and the weather! 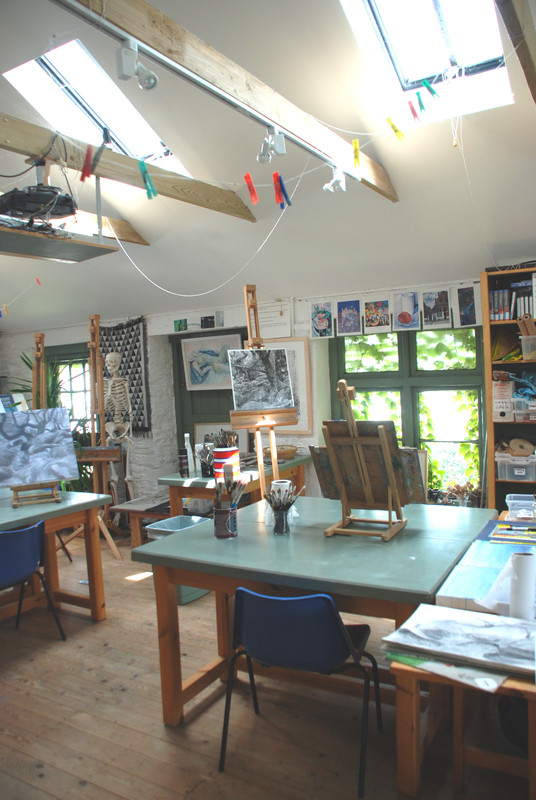 Most of our courses involve working both on location and in our studios. We want to give you as rich an experience as possible. Can I visit the school before I attend the course? Yes. We will always be around, just ring in advance. Full details of all our courses are on the web site. We can offer you accommodation in our adjoining 4-star Guest House. You do not need any previous experience for any of the courses but there are links between some of them such as photography and printing. (Basic Photoshop knowledge helps in manipulating your images for the photographic silk screen course but it is not essential.) We are always on hand to help. Are your courses suitable for disabled people? Whilst we have tried as far as is reasonably possible to make our studio accessible to all, the original construction of the building precludes some access. Please call us to discuss your requirements. Do you supply all materials or can I bring my own? We stock all the materials you are likely to need and basic stock is included in the price of the course. Please feel free to bring any unusual or special materials you might want to use or try out. Make sure you read the separate requirements in the course details as they do vary. We do sell some materials and there is a large art materials outlet in the town. It’s a good idea to bring a bag suitable for carrying materials in when we’re out on location. Make sure it’s big enough to carry an A4 sketchbook or bigger if you prefer. If you have a portfolio bring it to keep your work in especially if you intend to come by train, otherwise a carrying tube is good for carrying paper. Bring a pair of flat shoes suitable for walking in, especially if you like to walk on the moors or over rocks at the beach. A hat or sun glasses are advisable in the summer months as well as a thin jacket/waterproof. In the spring and autumn a warm hat, gloves and a jacket/waterproof. We will provide chairs, stools, easels and drawing boards.